If you prefer you can make one large salted caramel apple pie but the individual portions work well for snacking and lunchboxes. Sift the cake flour, salt and baking powder together. Add the sour cream to make the pastry. Roll out the pastry on a lightly floured surface into a 20 x 30 cm rectangle. Dust both sides with flour before folding the pastry into thirds – as if you were folding a letter. Rotate the dough 90 degrees and roll it out again into a 20 x 30 cm rectangle. Fold the dough in the same way as before. Wrap in clingfilm and rest the pastry in the refrigerator for 30 minutes. Preheat the oven to 200 °C. Grease and line a baking sheet. Mix the apples, lemon juice, castor sugar, cinnamon and flour together. Remove the dough from the refrigerator and unfold it onto a well-floured surface. Roll out to about 3 mm thick. Use an 8 cm circular cookie cutter and cut out 24–30 circles. Re-roll the scraps and continue cutting out circles until you run out of dough. Place half of the dough circles on the prepared baking sheet. Brush the circles with egg wash and spoon a portion of the apple filling into the centre of each circle, leaving enough of a border (about 1 cm) around the filling. Top the apple filling with a portion of the chopped caramels and a pinch of the Maldon salt. Place a second dough circle on top of each filled circle and then use a fork to crimp the edges together, sealing each pie. Brush each pie with more egg wash and, using a sharp knife, cut two or three vents into the top of each pie. Sprinkle the pies with sugar and bake for about 15 minutes, or until golden brown. 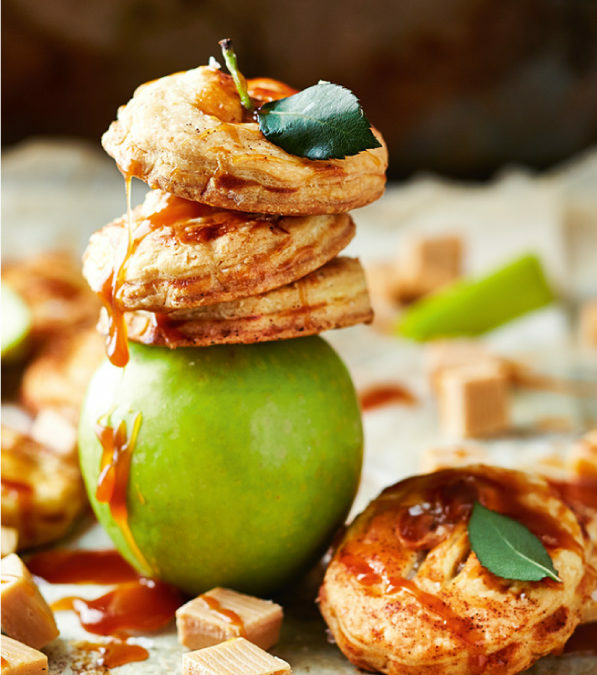 Serve the apple pies with a salted caramel sauce. 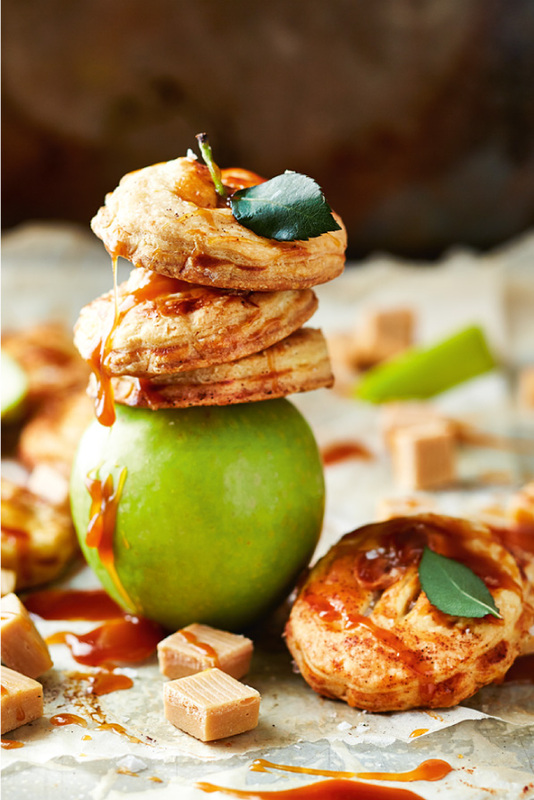 Cut out larger circles of dough (12 cm diameter) and make apple fold overs. Add chopped pecan nuts or flaked almonds if you like and dust the tops of the pies with cinnamon sugar.